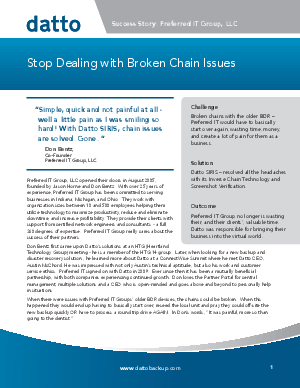 Preferred IT Group was tired of spending extra time and money dealing with broken backup chains with older BDR solutions. This headache was solved with Datto’s Inverse Chain Technology; there are no broken chain issues. Additional benefits include screenshot backup verification, instant virtualization, ease of use, and more.